I’d been looking forward to Supermono’s iOS arcade racer Forever Drive since it was previewed at the World of Love conference in January. So when I heard the other day that not only was it finally out but it was a free download to boot, I didn’t need any further encouragement to check it out. I’ve put a few hours into it now and I’m afraid to say I’m a bit disappointed. The game’s two major defining features – highly polished, TRON-like cyberpunk visuals and an endless, player-generated race track – are both present and by and large live up to expectations. However there are in my eyes several flaws with the game in its current incarnation, ranging from trivial to fundamental. Instead of just moaning about it, I’ve decided to go through the flaws as I see them one by one and try to figure out how they can be fixed in future updates of the game. The catalyst that made me decide to sit down and write this was Adam Saltsman’s strongly worded article on Gamasutra where Forever Drive is singled out as a game which incorporates the “freemium” business model in a particularly unsatisfactory way, and some of the (dismissive and frankly a bit haughty) responses that this drew from people who interpreted it as an attack on all freemium/free-to-play games. Forever Drive’s developer has stated that they put a lot of work into making the game’s freemium elements as unobtrusive as possible, and I have no reason to doubt that. I would charitably assume that the game’s problems in that area are more a result of the developer’s unfamiliarity with the model and a difficulty to see their game with fresh eyes, rather than cynical greed. But let’s start with the low-hanging fruit. The most glaring issue with Forever Drive on first loading it up is how poorly it explains itself. There’s no control tutorial (and you’re not told you can drift around corners with no risk of spinning out, among other things), and alternate control methods are buried in the options screen. There’s no upfront explanation of how the game’s scoring system works – that passing other cars increases your score multiplier and your top speed, and that it’s strategically advantageous to brake hard to get around tight corners as bumping walls and cars wipes your multiplier. Most egregiously of all, the player is presented with a choice of the game’s two playing modes with no prior warning that one of them costs “credits” that can only be replenished by in-app purchase (IAP). As reviews of the game have noted, the credit-sapping mode (which justifies its entry fee by awarding the player with ten times as many experience points) is positioned as the default option. Considered by itself, this could be dismissed as being simply a bit cheeky, but it’s really just the crowning item on a teetering stack of questionable design decisions. Immediately below it, there’s the decision to use consumable IAPs in a game like this in the first place. I’m mostly familiar with IAPs being used to unlock extra content (something which Forever Drive also features), or to gain items or abilities permanently in a game. You have to venture into the shadier end of the freemium market before you get to the point where your money gets you a fleeting, possibly not even effective boost. Forever Drive’s design obviously rules out selling extra tracks, and alternate gameplay modes might be prohibitively complex to create, but it’s still unusual that this is the approach they’ve chosen for their primary IAP mechanism. Especially as there is no way to earn credits through gameplay. Digging deeper still, there’s the problem of what your credits are actually buying. A typical ‘run’ in Forever Drive can be wildly inconsistent, particularly early on in the game when you have a ludicrously underpowered car. Someone playing the game for the first time and burning up their complementary credits in five minutes bumping repeatedly into walls and running out of time between arbitrarily spaced checkpoints (which the game very unsubtly seems to rig after between 3-5 tracks regardless of your playing ability) isn’t going to be rushing to the App Store to buy more credits, they’re going to be deleting Forever Drive from their device. The nearest analogue I can think of is foil packs of collectible cards (or stickers or Lego Minifigs) – but in that model, the risk of getting cards you don’t want/need is offset by the ability to trade them with others. There’s no way to get your credits refunded if the game serves up a series of broken tracks, or someone calls you midway through a run (or if your battery dies – on my 3GS the game seems to gobble up power more greedily than even Infinity Blade). The other IAPs (a different car, a couple of paint jobs and – seriously – a custom number plate, all at a dollar a pop) psychologically don’t come across as being good value either. There’s no option to just unlock everything for a one-off payment. Instead of taking cues (no pun intended) from Magnetic Billiards Blueprint (where every item is meticulously explained, and the pricing actively encourages you to buy the most expensive – but still eminently reasonably priced – item which unlocks everything and promises future content as well), Forever Drive’s approach to IAPs feels a little bit ‘RyanAir’. Getting away from hard cash for a minute, the user generated tracks system sports a whole buckyball of interconnected issues. At the moment the tracks that are served up sometimes work and sometimes are deliberately or accidentally frustrating to play. Each track the player completes can be given a thumbs up or thumbs down, which over time will hopefully improve the general standard (or result in a game with no corners whatsoever). I have a lot of confidence in the developers to keep tweaking this system, and putting in more automated checks to screen out bad tracks based on gameplay data as well as votes. Subjectively, the fixed, steep camera angle (with the curtailed view of the road ahead and slow speed that results) and narrow track (resulting in frequent bumps and brow-knittingly exacting play) combine to make the game feel significantly less thrilling or rewarding to the casual player than OutRun or Mario Kart, although with practice (and one of the better cars) the pleasure of stringing together long combos through skilful driving eventually reveals itself. Which brings us back to the whole “freemium” issue again. 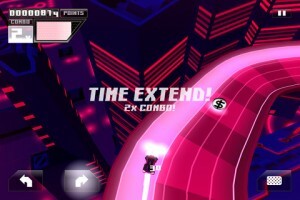 Forever Drive is guilty of punishing the non-paying player with tedium to an absurd degree, when it would seem more sensible to reward the free player, at least until they were invested in the game enough to feel that they want to buy something purely out of curiosity and by way of thanks, instead of by coercion and confusion. Once you finally trade up from the hatefully puny starter car (which takes a significant amount of grinding), the game becomes fun in a mindlessly hypnotic way, a bit like Death Rally. Hopefully, people coming to this article in a few months time will be able to download a version of Forever Drive that resolves many of the problems I’ve listed here. A version where the gameplay (from the track selection to the controls to the available playing modes) is further honed and made more rewarding, and the commercial aspect is presented in a transparent, friendly way that players feel excited to buy into rather than obliged. The iOS user doesn’t care how many months of work have gone into the game they’re getting for free. They have literally thousands of other games vying for their attention. Make them want to play, and to keep playing, and to ask for features, and to tell their friends. Rise above this evil Smurfberry stuff. P.S. : The per-track high score system is redundant as well, as it doesn’t take into account what the player’s combo was on starting the track, whether 500pt. powerups randomly appear and what car they have.